Sale-a-Bration (Stampin' Up! 's biggest sale of the year) is winding down, and in just a few days will be gone for this year. With that in mind, I'm posting a project made using SAB products. This is a simple card and one that you could easily make a lot of at one time for different occasions. I didn't stamp a greeting, but one could easily be added on the right side. The stamp set it Petal Parade and it's stamped 2 times, once in Coastal Cabana and once in Calypso Coral. The Coastal Cabana flower is punched out using the 1-3/4" Circle punch. The Calypso Coral flower is punched out using the 1-1/4" Scallop Circle punch. 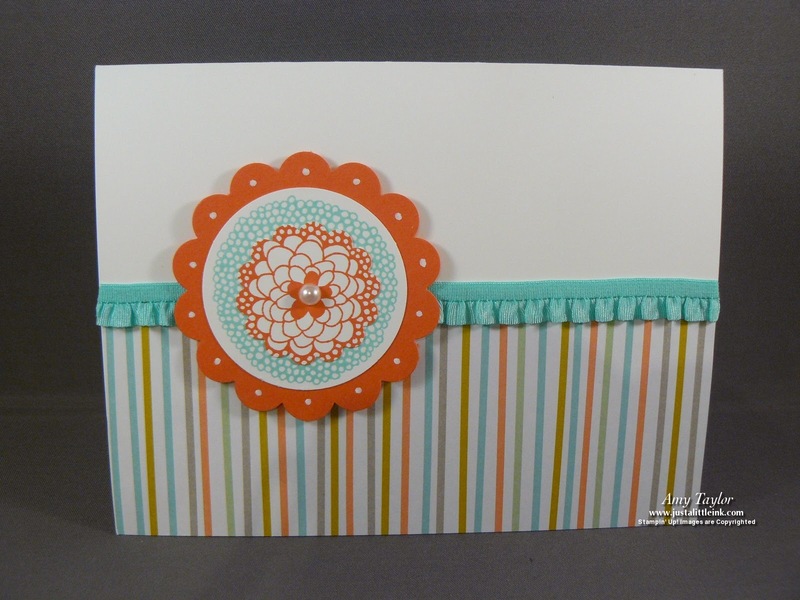 They are then layered onto a 2-3/8" Scallop Circle punched from Calypso Coral card stock. A Pearl Basic Jewel, dots made using the White Stampin' Chalk Marker, and a piece of Coastal Cabana 3/8" Ruffle Stretch Trim finish off the look. Don't miss out on the Sweet Sorbet Designer Series Paper! I'm so going to miss it and love the color combination.